When it comes to shower gels, I am a bit particular with them. Since I have dry and sensitive skin, I look for ones that are extremely moisturizing and gentle. Soap & Glory's Clean On Me Creamy Moisture Shower Gel ($5.00-$16.00) seemed like one that I could enjoy so, I decided to purchase the travel-sized version to try. Clean On Me contains mandarin peel, and a built-in body lotion which helps provide the skin with a moisturizing experience. The creamy formula produces a luxurious, silky lather that you really must try for yourself. It feels so amazing, and unlike any other shower gel I have tried before. A little dab of this gel on a shower puff goes a long way so I am sure a bottle will easily last awhile. The shower gel rinses away clean and after I have towel dried my body, my skin is left feeling fresh, clean and super soft. The fragrance in this shower gel is so yummy. I simply can't get enough of it! It smells just like the Hand Food Hand Cream, actually. It contains notes of rose, jasmin, bergamot, mandarin, strawberry, peach, vanilla, and amber which all merge together to create a comforting light scent, that lingers softly on the skin. Overall: I was pleasantly impressed with Soap & Glory's Hand Food Hand Cream, so it's no surprise that I am quite fond of this shower gel, as well. It has all the qualities that I look for when it comes to body washes. It's moisturizing, gentle, and overall a pleasure to use in the shower. When I am done using up this travel-sized version, I am most certainly going to be purchasing the full sized bottle, which by the way contains a very handy pump! 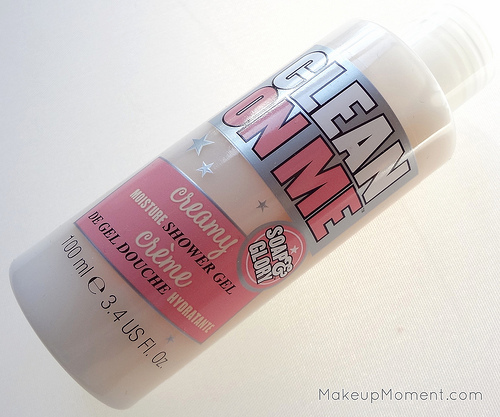 What do you all think of Soap & Glory's Clean On Me Creamy Moisture Shower Gel? Which are your favorite Soap & Glory products? Can you believe I haven't tried anything from Soap & Glory yet? This musts smell amazing, AHHH!!! I have never tried Lush's shower gels before. I have heard a lot of great things about Snow Fairy, though. It's very popular for the holidays. I missed out on it this time around, but when it is released again next holiday season I will be sure to pick up a bottle to see what all the hype is about! :) If you give this product a try let me know how you like it!